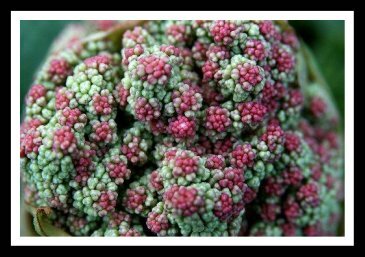 Have you noticed rhubarb flowers, or rhubarb seedpods coming up on stalks from between the leaves of your rhubarb plants this Spring? If so, here is important information in answer to the question of what to do with that large flower growing in your rhubarb! I think that the rhubarb flower stalk or seedpod is a very beautiful sight, and I really dislike the idea of removing it, however it must be cut out. 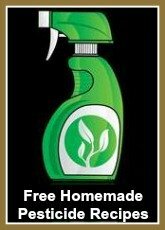 Scroll down for directions on how to remove the flower stalk. 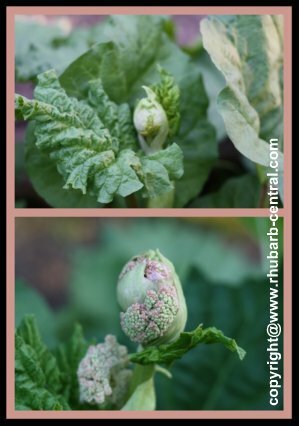 What Do You Do with the Flower that is Coming up in the Rhubarb? The flower head that comes up from rhubarb plants should be removed immediately when you first observe it. This flower or seedpod usually comes up in the springtime. These flower stalks do not usually grow on younger plants, but are common on more mature plants that are 3 or more years older. Some varieties are more likely to flower than others. The plants may produce more than one stalk, so cut them out each time you see a flower develop. To maintain and ensure the highest quality and maximum yield from your rhubarb garden, it is important that the plants not be allowed to go to seed. Many people contact me and ask if it is okay to harvest and eat the rhubarb after it has flowered. The answer to this question is YES, simply remove and discard the flower/seed pod stalk, and pick the remaining rhubarb stalks as you normally would. The reason for this is, that, if the plant is left to allow the flower to go to seed, the plant devotes its energy to the seed production, and the development of leaf stalks is hindered. Using pruning shears, cut the flower stalk as close as possible to the main plant at the base, and discard it. If you do not cut the flower stalk off as low as possible, it may begin to rot and provide a home to slugs and other insects which may in turn damage the rhubarb plants. Scroll down and see what Helen did with the flower stalks from her rhubarb plant! Thanks for the photo (above) Gina! Thanks for the photo (above) Marcus! My rhubarb went to seed this year too (above)! 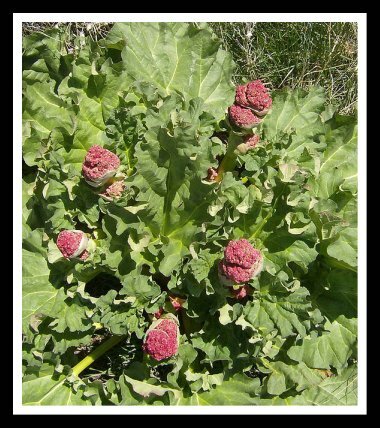 If you are growing ornamental rhubarb, and not using the rhubarb as a vegetable for the stalks, you may wish to leave the flower and ensuing seedpods among the plants. The tall flower stalks are actually quite impressive, and you would most likely wish to these beautiful flowers to bloom in this case. 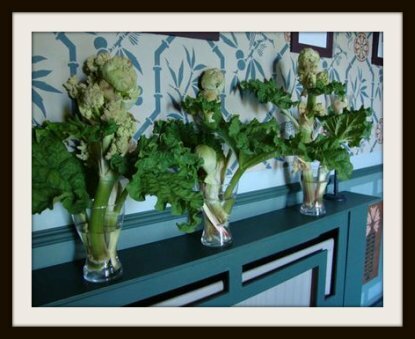 I came across this amazing photograph (above), of gorgeous, cut rhubarb flowers, arranged in vases with rhubarb leaves. These were not ornamental flowers and leaves ... but rather "regular/edible" vegetable garden rhubarb flowers and leaves. Isn't this beautiful, and striking? I Love It! ... Now I just hope that my rhubarb will actually flower next year, and that more than one of my rhubarb plants in the patch will flower! Thanks Helen, from Design Inspiration, for allowing me to share this amazing, creative arrangement of rhubarb seedpods/flowers! I believe you have just inspired many site visitors to bring the cut flowers from their rhubarb indoors when cutting them off, and enjoying them! They are an amazing display of God's Creation for sure! If you have made a flower arrangement using rhubarb flowers or rhubarb seed pods - feel free to send me your pictures for me to share with visitors to Rhubarb-Central.com! 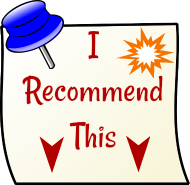 Contact me via my contact form here. 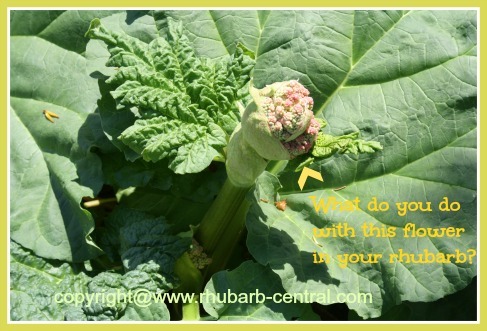 Do you grow rhubarb? 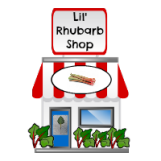 Here below (or use the navigation bars at the left column) are links to helpful pages within this website about growing rhubarb at home!